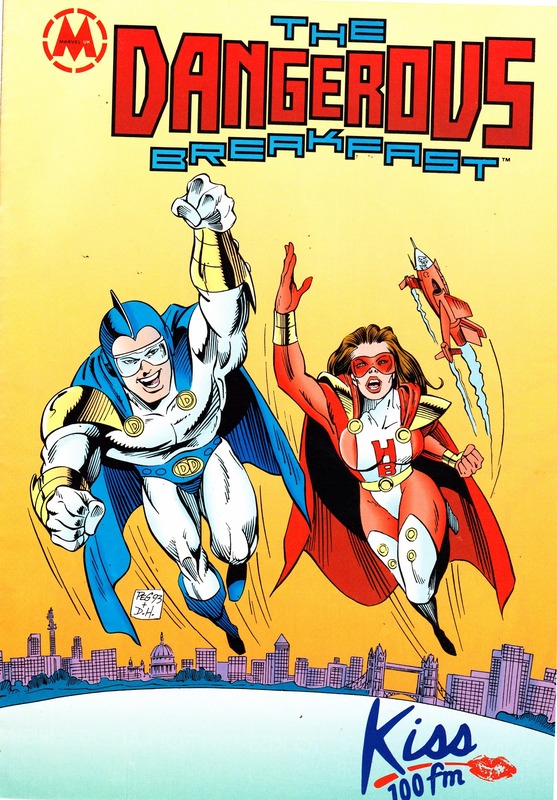 Is THE DANGEROUS BREAKFAST the rarest* British Marvel comic ever published? I'm gonna take a punt and say - quite possibly - yes! 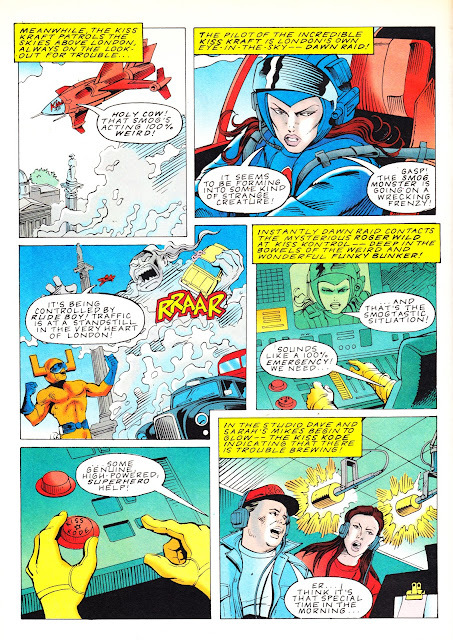 Marvel UK - and compiling this blog - still have moments that genuinely surprise me. This is one of them. I spotted this on eBay a while back and it blew me away - a 1994 Marvel UK comic I'd never even heard of**, much less seen. So I had to have it (luckily it didn't cost me too much). 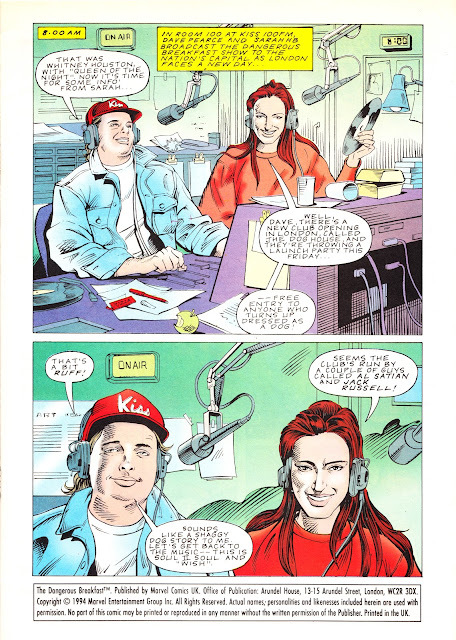 I know nothing about the history of this Arundel House production... but I'll fill in all the blanks I can: For the uninitiated, KISS 100 FM is a UK radio station and this 16-page one-shot was - judging by the various congratulatory ads inside - produced to celebrate the station's third birthday. The comic is A4 and full-colour throughout. There's ten pages of (uncredited) comic strip (of which I've posted the first four), the cover and the aforementioned ads. There's nothing - other than the cover logo (note the late M-UK disc design) and publishing information at the base of page 2 - to link it to Marvel or their other comics. 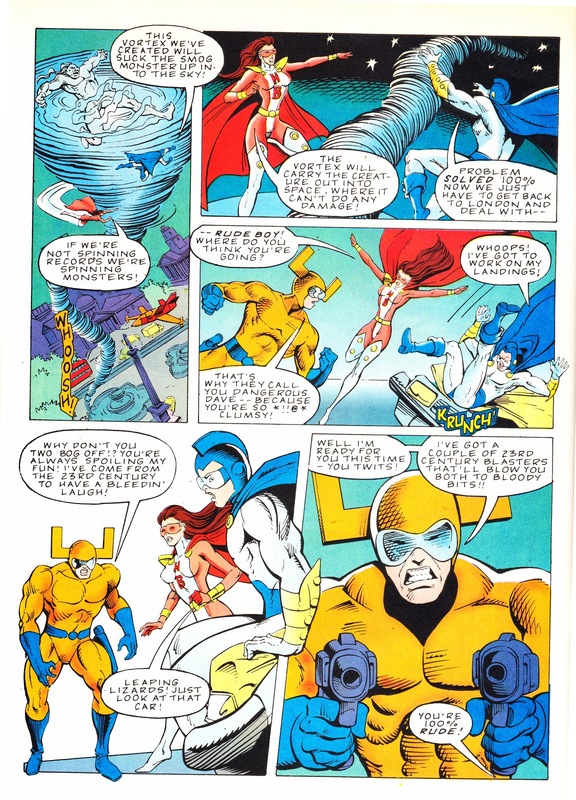 Despite the super-powered nature of the strip, no Marvel characters appear. This feels very much like a direct commission by the station for a tailor-made Marvel comic. I'm aware that this is something Marvel US has done on occasion (not to be confused with Marvel comics that feature licensed characters like The Transformers, Rom and numerous others) but I've never seen or heard of any other British examples (which - of course - raises the prospect that their ARE other examples out there... I've just not stumbled across them yet). I have no idea how widely this was distributed nor a possible print run. There's no cover price so I doubt it was ever sold to the general public. Maybe it was produced as give-away for the breakfast show? Maybe it was a business-to-business marketing stunt to catch the eye of adverting agencies who might do business with Kiss (this is a seldom-seen, but surprisingly large, marketing function in many media organisations)? Perhaps it was a competition prize for listeners to win? Maybe it was part of a third birthday goody bag given away at a party? It's easy to imagine that this was hyped as a "collectors' item" although the minimalist cover resists the temptation to add a boast to that effect. Does anyone know any more about this one? 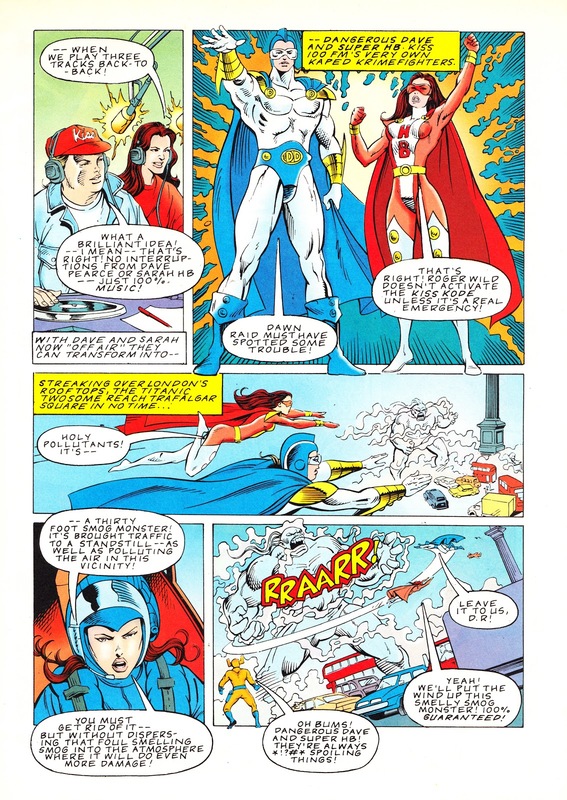 I can't find any mention of this anywhere else so - like my discovery of THE ENCHANTED CASTLE missing-Marvel TV show, I think I may have an exclusive! Maybe. * I'm deliberately - and quickly - excluding those seventies MARVEL COLLECTION bound compilations because, thanks to their anything-left-in-the-warehouse nature, its entirely possible that no two copies of the same collection featured exactly the same combination of issues in the same (random order). And - of course - office-only pilots and dummies not intended for circulation outside the industry. ** The cynical may claim that Marvel London produced A LOT of comics in the early nineties that no one has ever heard of... but we won't go there! What a great find! Check out Grant Goddard. He was at Kiss 100 from Day 1 and knows the full story. He might be able to shed some light on how they used the comic. Brilliant! And would you do a feature on one of those random, bound collections from the '70s if you have time?